It's magical! 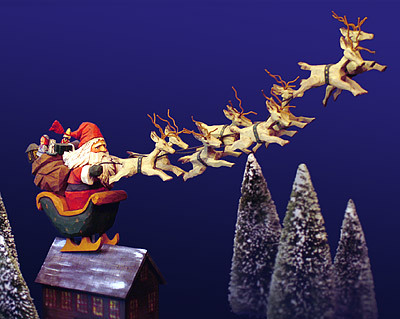 Santa and eight tiny reindeer flying over your house! You provide a photo of your house (or barn, play house, store, or whatever structure comes to mind) and we design it with Santa and reindeer flying over head. Tell us about any special toys that you would like carved and they will appear in Santa's pack. This one of a kind figure is hand-carved in basswood, painted in muted colors and finished in a warm patina.